New Hubble Space Telescope sending back first pics. NASA scientists showed off spectacular new pictures from the Hubble Space Telescope Wednesday, a stunning gallery of remote galaxies, a stellar nursery, an enormous globular cluster packed with countless pinpoint stars, and a dying sun blowing off its outer atmosphere in butterfly-like wings of debris. Planetary nebula NGC 6302, a star in the final stages of its life, in a dramatic new photo from the repaired Hubble Space Telescope. (Credit: NASA)The pictures clearly show the fabled telescope is back in action, ready to resume its role as one of the most productive observatories on or off the planet, thanks to a dramatic five-spacewalk shuttle repair mission last May. "Every field of astrophysics, whether it's our local neighborhood of planets, nearby stars and their attendant planets, galaxies, clusters of galaxies, out to the edge of the universe, every field has questions that are awaiting the power of Hubble," said Heidi Hammel, senior research scientist at the Space Science Institute in Boulder, Colo. "You're only getting the tiniest taste of what the astronomers are planning to do with Hubble over as many years as it can last. I alway wondered though, how do they get such clear images from a lens moving 17,000 mph? How could they focus it on a tiny little area for so long and gather the light for these pics, the way a ground based telescope does? They must take thousands of pics of same area and make a composit, but still, seems like it would be impossible to do. I wonder if these pics like this are touched up and altered by artists, based on data, or if that's the actual view of the telescope. I'm new here, I guess it's a general interest forum? Or only racist subjects? Not sure. Isn't it a matter of just snapping a picture? Doesn't the Earth rotate really fast too? We don't seem to have any problem down on Earth with taking pictures with the ole Kodak Vest Pocket Series III so why should a super high tec camera in the sky like the Hubble have any difficulty? Yes, general interest of all subjects combined with free speech which would include some discussions that some might deem "racist". However, the main aim we're trying to accomplish here is to raise the ratio of men to broads. As it stands now it's about 100 men for every 1woman. Hopefully we can raise that to 100-2 in the near future through diligence and hard work. Earth based telescopes, and the Hubble too, have mechanics (and gyroscopes) that keep the lenses pointes in one precise location for the duration of the exposure. In this regard, a telescope is like a big clock with the hands ticking backward. The backward motion must account for the forward motion of the earth’s rotation and in the case of Hubble, its orbital velocity. I alway wondered though, how do they get such clear images from a lens moving 17,000 mph? They don't. The Hubble space telescope is a hoax! Just like the moon landing. All the pictures are photoshop fakes. Not only that, NASA gets them made up on the cheap in China. Not sure. Isn't it a matter of just snapping a picture? I thought when they got pictures like this from telescopes, they had to gather light for hours, then they make a composite out of all the data, because the light is so incredibly faint, it's 600 million light years away. I don't really know though. I'm pretty sure that's how they used to do it anyways. "Staring at one spot in the sky for ten days, Hubble kept taking pictures one after another for the entire exposure time, accumulating data. Each exposure was typically 15 to 40 minutes long. Separate images were taken in ultraviolet, blue, red, and infrared light. By combining these separate images into a single color picture, astronomers will be able to infer — at least statistically — the distances, ages, and composition of the galaxies in the HDF image." I bet that would make a great concert photography camera. Maybe a bit large to tote around though. I wonder if these pics like this are touched up and altered by artists, based on data, or if that's the actual view of the telescope. I think if you were near that star you would not be able to see the beautiful dust clouds because images like that are composites of visible (what we see with our eyes) and infrared light and possibly some other spectrums that man cannot naturally see. Political correctness is an intellectual gulag. Last edited by Hugo Böse; September 12th, 2009 at 07:16 AM. Original Caption Released with Image: NASA's Spitzer, Hubble and Chandra space observatories teamed up to create this multi-wavelength, false-colored view of the M82 galaxy. The lively portrait celebrates Hubble's "sweet sixteen" birthday. 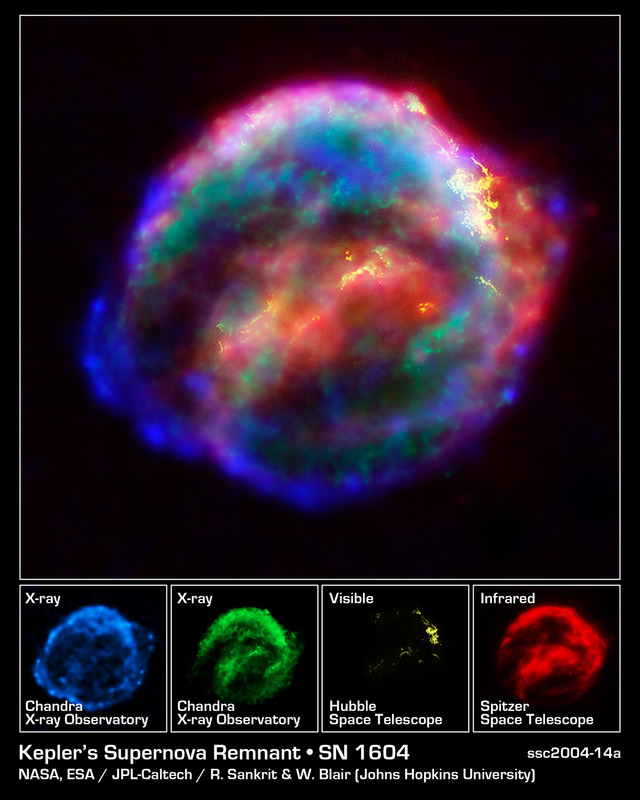 X-ray data recorded by Chandra appears in blue; infrared light recorded by Spitzer appears in red; Hubble's observations of hydrogen emission appear in orange, and the bluest visible light appears in yellow-green. Last edited by Hugo Böse; September 13th, 2009 at 09:06 AM. Page generated in 0.13040 seconds.